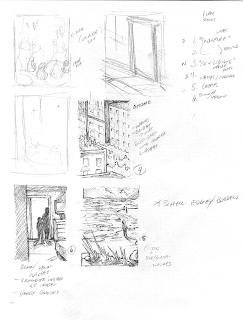 Today, I did sketches for the next 3 pieces of the "1day" series. I'm a bit excited about it. Below are the images from my sketch book. That will make 6 pieces for the series. My first collection. As I've mentioned, the goal will be to set them up as a showing at a local coffee shop or gallery. I feel motivated again, which I'm excited about for obvious reasons.